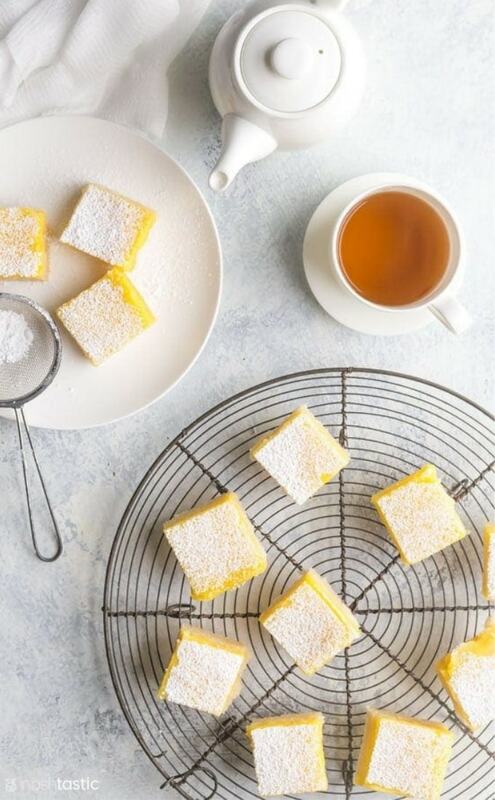 BEST Gluten Free Lemon Bars - Dairy Free Option! 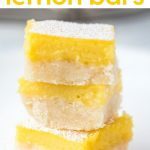 Gluten Free Lemon Bars – If you’ve been missing Lemon Bars because you’re gluten free, fret no more! 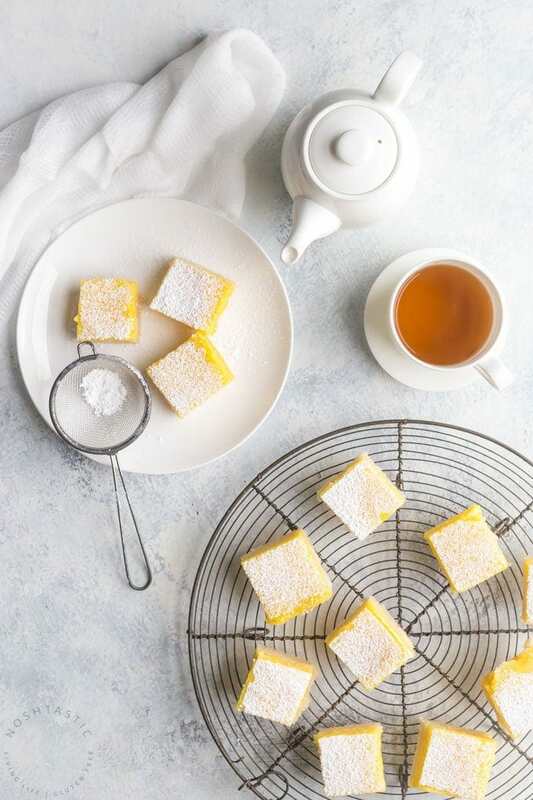 My recipe for Gluten Free Lemon Bars has a really lovely soft gluten free shortbread crust and I promise that you’ll not end up with a soggy crust using this recipe if you follow my simple tips and step by step directions! 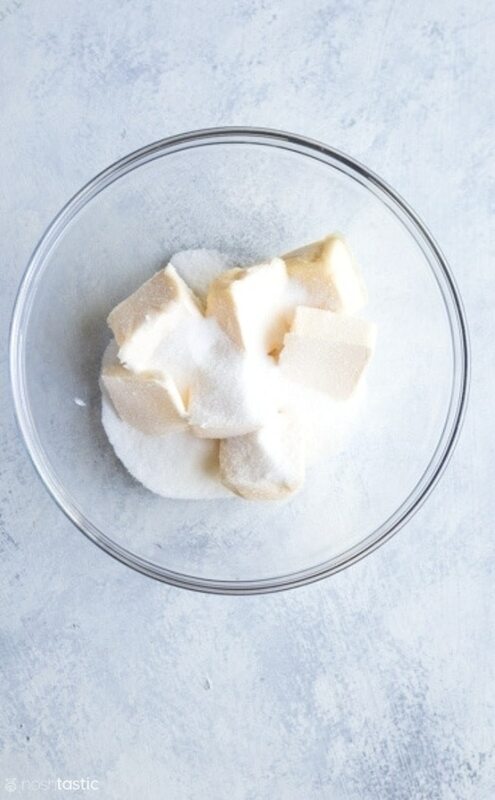 The first step is to add the dairy free margarine (or butter if you are not dairy free) and sugar to a bowl and cream them together, this will form the basis for your gluten free lemon bars shortbread crust. I find this easier in a stand mixer but a hand mixer will work too. 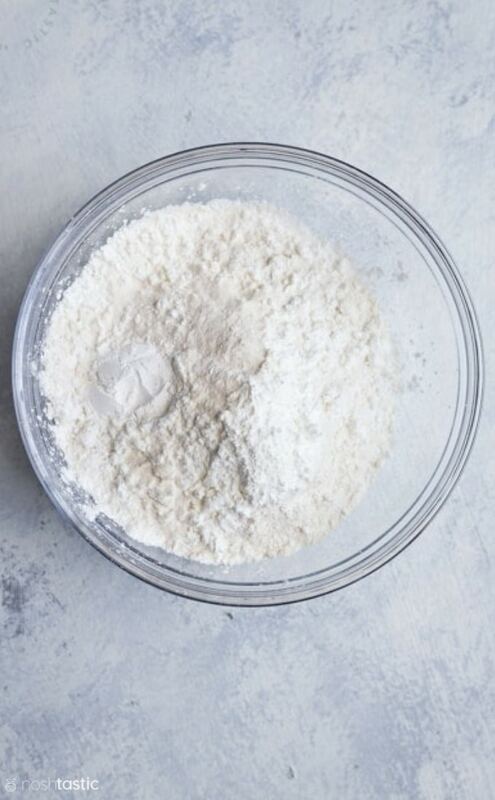 Then, measure your flours for the gluten free shortbread crust accurately into one bowl, then add the baking powder and xanthan gum and stir together. Next, slowly add the gluten free flour mixture to the butter and sugar and mix together until you get that a crumbly mixture like you see in the photo. Then all you need to do is form it into a ball either with hands or using the paddle attachment in a stand mixer. If you’ve used dairy free margarine instead of butter you may find that it’s really soft at this stage, so if that’s the case let it sit in the fridge for 30 minutes to an hour. Once you’ve done that, press it into the parchment like baking pan like you see in the photo below. Once it’s all in there, use the back of a spoon or an offset spatula to even out the surface. Now put in into your preheated oven and bake for 20 minutes or until the crust for your gluten free lemon bars gets a little brown around the edges. For the Gluten Free Lemon Bars Topping you need to part cook a lemon curd which will then form the topping. All you need to do for this is to add the lemon juice, eggs, sugar and butter to a pan and warm over a low to medium heat and stir constantly until it starts to thicken up. This will take about 5-6 minutes. Do not panic if it starts to curdle a little or thicken up in the edges of the pan, but take care not to have it on too high a heat. 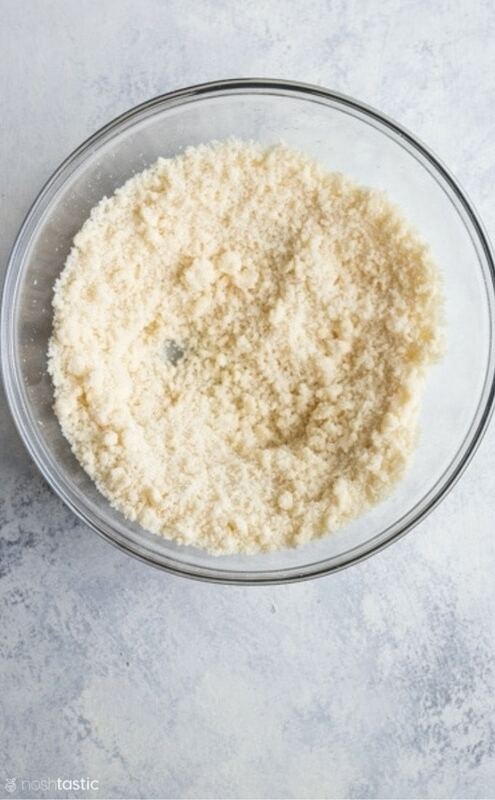 Once the topping for your gluten free lemon bars has thickened, push it through a sieve and over the top of the baked shortbread crust and bake for a further 15 minutes. Remove your gluten free lemon bars from the oven and cool for about 20-30 minutes, then refrigerate for at least two hours, preferably four hours to let it set up. It will be much easier to cut if you chill it first. In response to some reader questions about soggy crusts in their gluten free lemon bars. I set about coming up with a way to prevent that from happening. 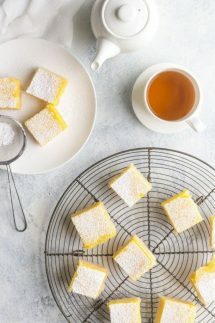 The problem arises from the traditional method of pouring the uncooked lemon bar topping over the shortbread crust as it will sometimes seep into the crust during cooking, and then if the lemon bars are refrigerated they can become soggy overnight. I suspect some of this depends on several factors including the blend of gluten free flour used, the actual temperature of the oven, and the type of bakeware used to bake it in. A foolproof way to avoid this issue is to part cook the gluten free lemon bar topping in a pan before pouring over the shortbread crust. 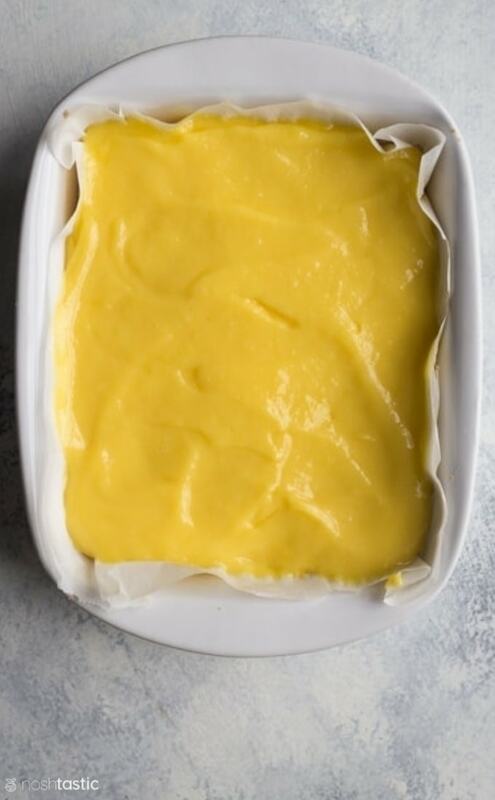 The thickened lemon curd type topping will not make the crust soggy during baking and it will not cause problems afterwards of the topping seeping into the crust and making it soft as it chills in the fridge either. 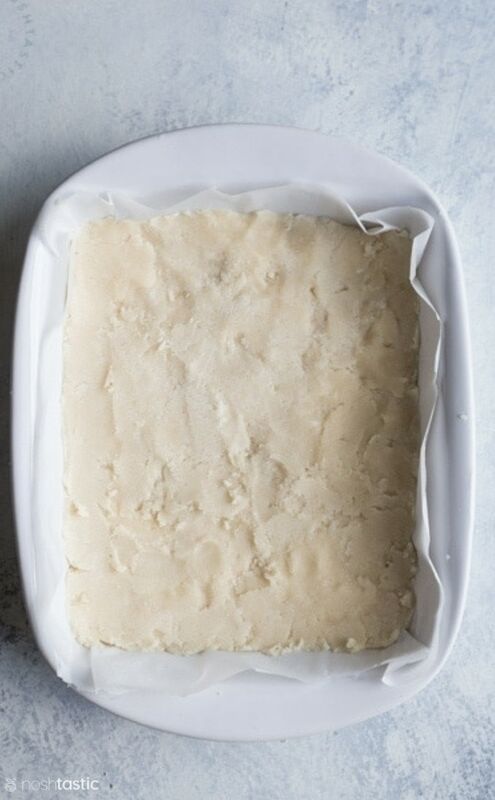 Parchment – line your baking pan with parchment and be sure to leave enough coming up the sides of the pan so you can easily lift the lemon bars out once they have chilled. Xanthan Gum – this is essential to ensure that your gluten free lemon bars will not fall apart so don’t skip it. Digital Kitchen Scale – I prefer to bake by weight as it’s more accurate so I highly recommend getting a digital kitchen scale. Lemon Juice – this recipe is best with fresh lemon juice! Cornstarch – you can swap this for tapioca starch, arrowroot, or potato starch. Please note that potato flour and potato starch are not the same, and that tapioca starch and arrowroot tend to be quite sticky and I have not tested it with this. Ready made Gluten Free Flour – you can use a ready made blend such as King Arthur’s gluten free flour or Bob’s 1:to:1, however I have not tested my recipe with these flours so I can’t say how they will work. How much lemon juice is equal to one lemon? One lemon has approximately 2 tablespoons of lemon juice in it. If a recipe lists the juice of 1 lemon as an ingredient you can use two tablespoons of bottled lemon juice instead. However, for my gluten free lemon bars recipe freshly squeezed lemon juice tastes better. 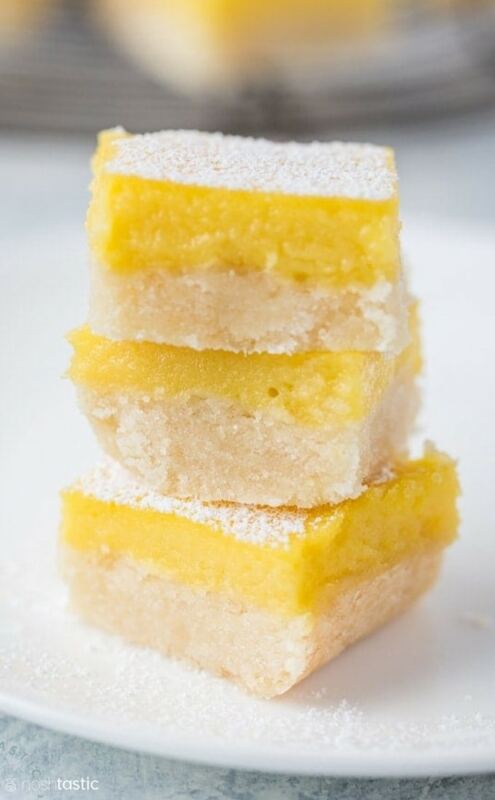 Do you keep gluten free lemon bars in the fridge? I put my gluten free lemon bars in the fridge for at least two hours after they are removed from the oven, this will help them set up. Technically they do not need to be stored in the refrigerator but it’s warm where I live so that’s where I keep them. I cool them in the pan that I baked them in for about thirty minutes at room temperature after they are removed from the oven. Then, I put them in the fridge for at least two hours to four hours to let them set before I cut them. Recipe newly updated in 2018, for details on previous version please read the recipe notes. Add flour mix to butter/sugar and mix well until combined. form the mixture into a ball either by hand or using the paddle attachment on your mixer. The shortbread dough may be soft, especially if you used vegan butter. If this is the case simply refrigerate it for 30 minutes to 1 hour to firm up. Press your dough into the parchment lined baking pan and spread out evenly using an offset spatula or the back of a spoon. Bake at 350F for 20 mins or until lightly brown at the edges. Add the lemon juice, eggs, sugar, and butter, to a pan over a low to medium heat and stir constantly until it starts to thicken. It will take about 5-6 minutes. Don't panic if it starts to curdle, but do ensure that you don't have it on too high a heat. 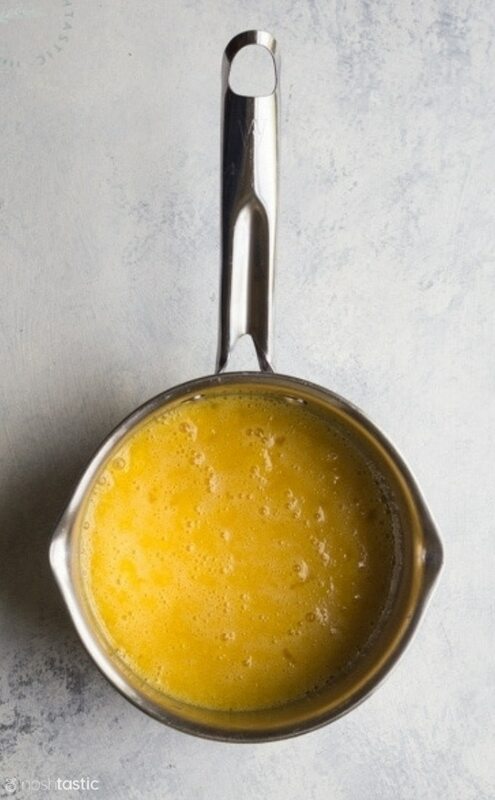 Once it's thickened up to almost lemon curd consistency, remove it from the heat and pass it all through a sieve. Pour the sieved Gluten Free Lemon Bars topping over the cooked shortbread crust and return to the oven to bake for a further 10-15 minutes. Remove from the oven and cool in the fridge for at least two hours or overnight to let it set up. The lemon bars will become firmer the longer they are chilled. Remove from the baking pan using the parchment to carefully lift them out, then cut into pieces. I recommend the new version of my recipe as it works every time, but if you prefer the old version you'll find the ingredients and directions listed below. The gluten free shortbread crust is the same in both versions, but the lemon bar topping ingredients and method of cooking have been updated and improved. Here's the original ingredients for the gluten free lemon bar topping. If you use these ingredients instead of the ones now listed in the recipe, simply mix them together and when shortbread base is cooked, pour over topping and return to the oven to bake for a further 30 minutes or until the center is set and no longer moves when you shake the pan. Chill for at least two hours in the fridge. Wow! These look so delicious! I’ve not mastered gluten free pastry yet but I bet you could possibly use the shortbread recipe as a pastry base, it would be perfect! Hi Vicky, thanks for stopping by! I don’t know if I could make it thin enough to make pastry, it certainly would taste good that’s for sure! 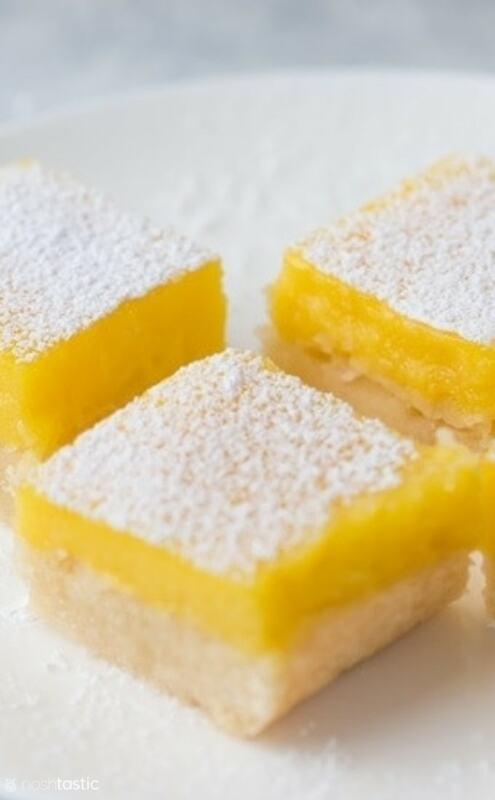 These lemon bars look SO incredibly good! I must taste them! i am a newbie to gluten free baking, it’s tricky! I used Glutino flour and xanthum powder, followed the recipe exactly, but it was a dud. The crust did not set up correctly and the lemon filling literally had a crust on it. Weird?. Since I am inexperienced baking gluten free, do you have any idea what I did wrong. The taste was good, but nothing like a real lemon bar. Thanks if you have any advice. Hi Jenn, Thanks for getting in touch and I’m so sorry they did not turn out for you! I’ve made these several times and they always turned out ok, the only time they did not I had used a flour blend with gum already added and they were just a smushy mess, but everything else was the same with the recipe. I usually make my own flour blend or use a mix without gums added. Firstly it looks like the glutino flour blend has acacia gum added to it, now I’m not familiar with that ingredient but I’d imagine it’s an alternative to xanthan or guar gum in which case you would not need to add any additional xanthan gum, that may have given you a more sticky dough. Did you use a 9×13 pan? It will alter the cooking time if the pan is a different size. I had the same result. My lemon topping also had a hard crunchy crust on top, and the bottom was very sticky, it seemed like the filling seeped down to the bottom of the pan? I followed the recipe exactily, including making a gf flour blend like the one you use/suggest. Not sure why it didn’t turn out, I am also fairly experienced, we’ve been gluten free for 6 years. But still, my family ate them. They were very sweet and I like mine a little more lemony than these turned out. Hi Sarah, I’m so sorry they did not work out for you, that’s very disappointing. I will ask my baker friends if they have any ideas as to why that might happen, I’ve never had mine cook with a crust on top so I’m not sure why that would happen either, I’ll let you know what I find out. I have seen a few people comment on other Lemon bar recipes (gluten free and regular) that they had similar issues with a soggy crust but it doesn’t seem to happen to everyone. I’ll see if I can find a fix, I appreciate you letting me know. Hello there. Last week I made this recipe using the correct pan size (9 X 13) . I also used a gluten free flour mix (King Arthur with X.Gum) and nixed the extra added gum in the recipe. I also had mine crust over on the top. It was still quite jiggly, so I covered mine with aluminum foil and baked it another 5-10 minutes or so. I put it in the frig immediately and let it set. The crust was a bit crunchy and over cooked on some parts, but it tasted lovely! My non-gluten free friends and family really liked them! Hi Sarah, I’m on vacation and just found your comment in my spam folder so apologies for the delay! I’ve only ever made it with sugar, but I know another blogger who makes a lot of low carb baking and she uses swerve sweetner a lot so you perhaps you could try it with that? It’s made from erthyritol which is very low carb but it does not agree with me (I have lots of gut issues 🙂 ) so I’ve never cooked with it. They look incredibly delicious, and I really love the photo, too! Thanks Nicole, you’re so kind to say that about the photo! Oh these ideas sound great ! I can’t wait to see a strawberry shortcake dessert. I’ll keep watching!! When I measure out and weigh 1 1/2 cups flour it is closer to 150 grams, not 250 grams as indicated in the recipe. Is it possible that the measurement reference should actually be 2 1/2 cups flour? Hi Heather, I’m not sure what flour you are using but 150 grams per 1.5 cups seems very low for any type of flour, the average that seems to be stated online (for wheat flour) is 125g per cup and it would typically be more if you are using gluten free flour. I was baking a different recipe this week and my gluten free flour mix weighed 160g per cup, so that would make 1.5 cups of that mix at just under 250g. If you have a scale then stick to using that, it’s the most accurate. Has anyone tried using coconut oil instead of margarine or butter? Or is there another dairy free substitute? Hi, I have not tried this with coconut oil so I’m not sure how it would turn out. If you do try it with coconut oil I’d try it with the oil in its solid form, not liquid.I don’t know of any other dairy free alternative I’m afraid. I was wondering the same thing since I don’t have a butter substitute right now and want to make these tonight. Did you try it? I didn’t have enough butter so I used about 1/3 butter and 2/3 coconut oil and the crust was perfect. I think using all coconut oil would work. I also added 1/4 teAspoon of salt to the crust since I use unsalted butter and used coconut oil mostly which doesn’t have salt. It was so good. I can’t completely answer but I think it’d be okay. Did you try it? Hi Shannon, that’s good to know it worked like that, do let me know if you try it with all coconut oil, I’m interested to know if it works! These look amazing!!! I think I have all of the ingredients in my kitchen right now…I know what I’m doing this afternoon! Thanks Sarah, I hope you enjoy them! Hi, crazy question… Can you use spelt or whole wheat pastry flour instead? I am allergic to dairy but have no gluten issues. Thanks! Btw these look amazing ???? I think it probably would work with whole wheat flour, but I can’t promise that it will because I’ve never tried it. The amounts I have may not be exactly right for a wheat flour crust, but I think it would be pretty similar, let me know if it works! Hi, I made the flour blend, and measured in grams, and my crust was very dry, crumbly and not moist at all. I’m not sure what I did wrong, I double weighed everything, and it was all correct. It’s baking now, but I have no clue if it will work at all. Any ideas? I made these for a Christmas gathering and they turned out fabulous! I used organic cane sugar in the crust and half organic cane sugar, half maple syrup in the filling to make it a little heather. They tasted as good as traditional lemon bars. A keeper for sure! Hi Beth, I’m thrilled that they turned out so well for you and I appreciate you taking the time to let me know! What a great idea to sub some of the sugar for maple syrup, I bet they tasted fantastic! 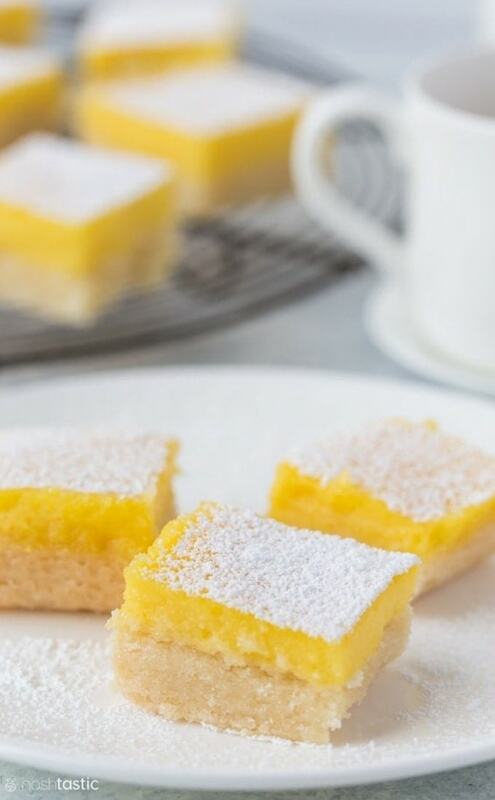 These lemon bars look divine! Oh, how I wish this was in my belly right now. Pinning this to make REAL soon! These look heavenly and dairy free too??!! Be still my heart and stomach! I just made these for a potluck, and after taste testing them I have to say that they’re pretty wonderful! I added about 1.5 TBSP lemon zest to the filling to make them even more tart and lemony, and I used about 1 TBSP less sugar than called for in the crust and the filling. I thought 1/4c cornstarch seemed like a lot so I used 3 TBSP and the filling set up nicely. I didn’t have any xanthan gum but the crust seems fine without it. This made a very thin bar for me, not as tall as yours look but I did have a little less volume since I didn’t use as much sugar as called for. There are a few gluten and dairy free families coming to the potluck, I’m so happy to have a “normal” tasting dessert to bless them with! Hi Rosanna, I love to hear of folks making gluten free treats for others and that they turned out well, I’m sure the folks at the potluck will love them! Thanks for the recipe! I made these according the recipe (thanks so much for including the weight- makes everything faster and more accurate) and they turned out great! I made my own flour blend from sorghum flour , brown rice flour, xanthan gum and tapioca starch. The only thing I changed was to do an extra quarter batch of the filling, I was afraid the bars would be a bit thin. The bars were devoured by the gluten free and gluten eating guests equally!! So glad it worked for you Erika! Hi Estelle, I’m so pleased that they worked for you!! Will almond, rice and tapioca flours work well? They’re gum free so will use xanthum. Trying to stay gluten free, love your blog. Hi Virginia! I’m so glad you love the blog! I’ve not made it with almond flour so I’m not sure what amounts you would need and how that would work in the flour mix (I have made it with mixes that have rice and tapioca though). So, if you really want to try with those flours I would try half rice flour (125g), and a quarter each of almond (62g) and tapioca (62g) and see if that works. Also I would cut back the butter/margarine for the shortbread base as almond flour is high in fat and you may get a super greasy crust if you use the full amount. Again, I’ve not tested this with almond flour so that’s my best guess! If you try it let me know if it works! Just made these lemon bars. Very lovely! Luckily I tasted the dough and realized I had used salt free butter, so added a sprinkle of salt. They were just amazing, the shortbread crust was really nice. I did make them in my convection so they baked up quite fast. I had no problems at all. I dropped some clumps of dough all around my 9 X 13 pan and then kept putting my hand into my GF flour in order to press it all down w/o any stickiness. it baked up nice and just a hint of brown. Everyone loved them! I have made this recipe bars at least five times now, and they are the best lemon bars in the world. The shortbread crust is amazing. People who don’t even know what gluten is love these bars. I use your lemon curd recipe for the filling. I just found this today by googling gluten free dairy free lemon bars. I’m very impressed with the quality of the cookie layer. It wasn’t crumbly like a lot of GF baked goods. The flavor is the same as every other lemon bar I’ve ever eaten too. The only thing different was the texture of the lemon layer; kind of grainy instead of more gelatinous. Maybe I shouldn’t have allowed some of the flour from the cookie layer to remain in the bowl when I went on to mixing the lemon layer. I’ll be tidier next time. It’s still yummy anyway! Oh, one other thing. It’s more lemony in the center and loses a bit of flavor at the edges.. I think the 30 minutes might have been slightly too long with my oven so the edges are too well done. This recipe is definitely a keeper for me! I made these for the first time today and they turned out better tasting AND less complicated than other GF lemon bar recipes. I used Earth Balance to make them dairy free also. Thank you for the great recipe, tips, and dual measurements. Weighing ingredients is so much easier than filling cups! I am looking forward to trying more of your recipes! I think I have a new go-to dessert for hostessing. Just made these. They tasted great. My crust was a bit crumbly and the lemon topping crusted over like some others commented. I bake at high altitude in a dry climate. I also used a pre-made GF flour blend. I plan to make these again with some adjustments for my situation. The crust was crumbly when I first mixed it and GF flours vary, so I will mix the crust with less flour to start with and add in until it’s the right texture. The lemon layer was kind of thin in my pan. I think that’s why it crusted over. I might try an 8×12 pan next time to get a thicker lemon layer. Definitely a good recipe and worth experimenting. I liked the idea of adding in some extra lemon zest, too. Thanks for the recipe! Does anyone know how far in advance you can make it? I need it for Sunday afternoon, but want to start it Saturday morning. Has anyone tried freezing these? I want to make them on Sunday for Thanksgiving on Thursday…? I made these today, weighed and measured carefully, but have a brown not very appetizing looking top and a very crumbly base. So disappointed. I dont think I will try these again. Hi Jane, I am sorry they didn’t work for you. Did you bake by weight or with the cups, what flour blend did you use? I made these tonight and they were delicious! I used my own gluten free flour blend that is similar to yours, except mine doesn’t have Sorghum Flour in it. I measured everything by weight and my crust came out nice and crisp prior to cooling in the fridge. It’s sweet and tart and tasty! I’ve been looking for a replacement lemon bar recipe ever since I went gluten and dairy free. I no longer have to look! This will be my go-to recipe from now on! I made these this weekend, absolutely delicious!!! I used Namaste foods Gluten Free Perfect Flour Blend for the crust and it worked wonderfully! I didn’t have an issue with the crust getting soggy either. A great bake, will definitely be making again! Yay Elyssa!! 🙂 Did you use the new method, the one where you cook the lemon bar topping a little bit on the stove, or the old method? Hi Lily, the print button should be fixed now, let me know if you have any other issues. hi Sheena! is there anyway i can make this without brown rice flour? Hi, I would just replace the brown rice flour with white rice and it should work. Can these bars be frozen? I’ve never tried to freeze them so I can’t say for sure.